Todo EN UNO FRP 2016 is a small application for Windows Computer which allows you to remove or bypass FRP from the Samsung Devices, LG Devices, Motorola Devices, HTC Devices, Alcatel Devices, Huawei Devices, Otros Devices, Sony Xperia Devices. It also comes with the FRP removing tutorial which helps you to quickly and easily remove the Factory Reset Protection from majority of Android devices. 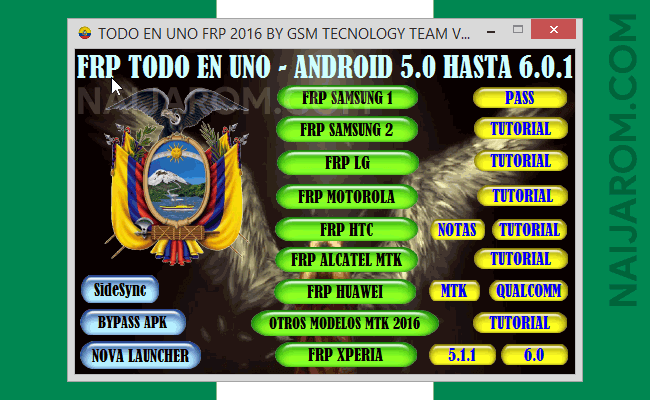 Todo EN UNO FRP 2016 supports devices running on Android 5.0 to Android 6.0.1. If in case your device is running on Android 7.0 or Android 8.0 then it may not work for you. It also comes with some extra features of SideSync, Bypassing the FRP through APK App, Installing Nova Launcher on your Android device. [*] Credits: Todo EN UNO FRP 2016 Tool is created and distributed by GSM Technology Team (developer). So, full credits goes to GSM Technology Team (developer) for sharing the tool for free.